For a number of months I have been using multiple machines to get up to speed on the Hyper-V stuff in 2012. Using a laptop and a Mac Mini, I had myself a nice little set up – Windows Server 2012 with Hyper-V on both machines, a network in between, some Storage on a NAS and I was Live Migrating, Replicating and failing-over till my hearts content. It was a lot of kit to maintain, but it was worth it for the learning experience. I had actually purchased the Mac Mini specifically for this purpose about a year or so ago. But then last week, I stumbled across this post. 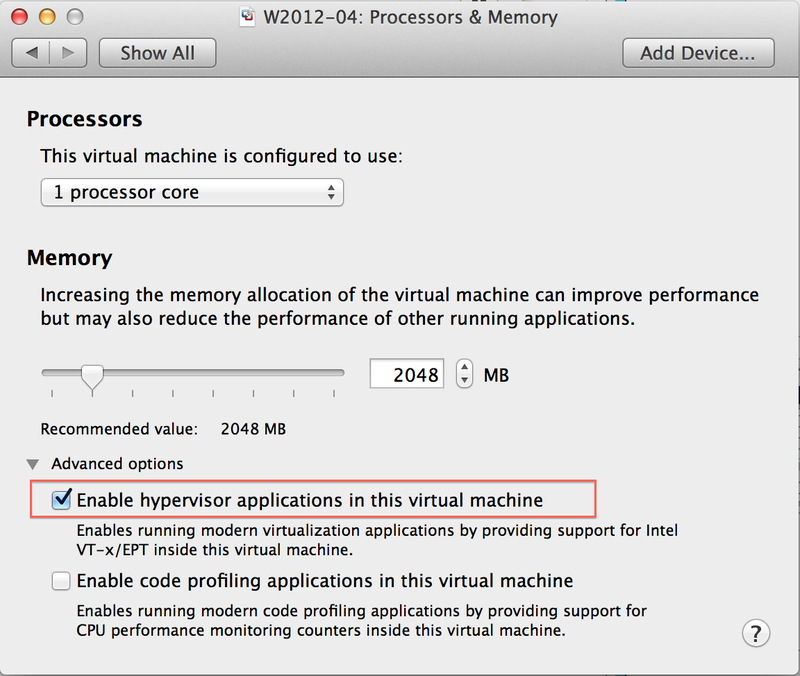 While this post talks about running Hyper-V under VMWare Workstation (for Windows), I figured if it was possible on Windows, it would be possible on Mac (for which I have VMWare Fusion). So after a quick scout on the VMWare site I found this article, which shows you how to edit the Configuration file directly on a Mac for a VM. A few edits later and I was running VM’s on Hyper-V Server within a VMWare Fusion VM on my Mac Book Pro! Whether this was there before when I last used VMWare Fusion, I couldn’t tell you. It certainly was not something I remember but basically this setting removes the requirement to edit the configuration file directly. You just tick this box, boot up, install Hyper-V and off you go. Of course, this is not something recommended for any production environment (disclaimer disclaimer etc. etc.) but if you’re studying for exams and trying to get your head around Hyper-V Migrations and so forth, VMWare for both PC and Mac will help you do that – it will also save you some money, now that I can run everything from my laptop I’m off to put my Mac Mini on eBay! … Anyone in the market for some Apple kit? ?